Sports Spectrum spans the entire world of sports to bring you athletic stories with eternal impact. Our website, magazine, podcast, videos and devotionals are intended to display an athletic lifestyle that is pleasing to God. 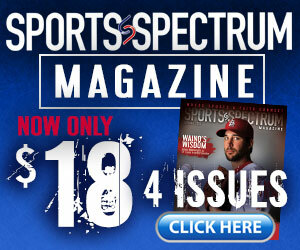 Since 1985, Sports Spectrum Magazine has been a resource for sports fans who are followers of Jesus. The quarterly publication includes devotionals from pro athletes and chaplains; previews, recaps and interviews; and stories of athletes of all levels displaying an athletic lifestyle pleasing to God. Hosted by Jason Romano, the Sports Spectrum Podcast has been downloaded more than 500,000 times. Featured guests have included Kirk Cousins, James Brown, Francis Chan, Benjamin Watson, Matt Forte, Sam Ponder, Matt Hasselbeck, Jenny Finch, Adam Wainwright and more. The first-person voice of the Christian athlete. With more than 50 testimonial videos shot, and hundreds of articles written by the athletes themselves, The Increase is reaching millions in Jesus’ name through the world of sport. A free 28-minute Super Bowl Sunday sermon-replacement video that has featured Drew Brees, Carson Wentz, Trent Dilfer, Brandon Marshall, Thomas Davis, Matt Hasselbeck, Anquan Boldin, James Brown and more. Viewed by more than 2.5 million people in 5,200 churches around the globe, with 20,000 people accepting Christ after watching. Click here to sign them up!